Saturday’s were for watching football with dad. Saturday’s were for falling asleep while watching football with dad. Saturday’s were for swapping old stories with dad about our times playing golf, going to hockey games, camping memories, stock car drivers, and good jazz music. Saturday’s were for momentarily taking a break from the stresses of this world. Saturday’s were for spending time with dad. Everything felt OK back then… no matter that which the weekdays brought. Saturday’s were for dad helping me feel recharged, encouraged, and confident that whatever the week brought… everything was going to be OK.
Saturday’s meant more back then. Or at least that is what it seemed like during those years following his passing. 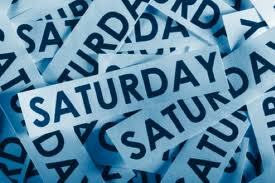 Maybe Saturday’s were just what I have been looking for? I am starting to find my way back to Saturday’s again. Now it is time to make my own Saturday’s with my own family. What will they look like? I hope they look like as good as those memories with my dad feel. Maybe it wasn’t that which I brought to Saturday’s that made it what it was as much as it was about how dad made me feel on Saturday’s? Right now, my daughter is giving us a fashion show with her new school clothes. She looks beautiful. As we tell her this… she smiles. Hello Saturday! Guess who’s back? Previous Previous post: Hope, I must have you.